If there’s one thing this Ginger Book Geek likes it’s discovering new authors. Well Stuart James is certainly a new author to me. 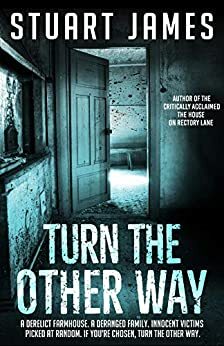 I must admit that I don’t normally read horror fiction but they do say that a change is as good as a rest and so I eagerly began to read ‘Turn The Other Way’. Blooming Nora, ‘Turn The Other Way’ is certainly one heck of a stonking read. I thoroughly enjoyed reading it but more about that in a bit. There are a lot of characters within this book and at times I did have trouble keeping track of who was who. That’s more to do with my lousy memory and cannot be taken as a criticism of the author. Stuart James has cleverly devised his characters, who have more layers to them than you would find on an onion. Peel one layer off and up spring another dozen layers. I have a bit of a vivid and wild imagination but even I had trouble trying to fathom out who was linked to who and why so in the respect the author certainly kept me guessing. Oh my word, I cannot get over how much I enjoyed reading ‘Turn The Other Way’. I do love a good thriller and as soon as I picked the book up, I found that I became totally immersed in the story. Stuart writes so well and so convincingly that I literally felt as though I had leapt into the pages of the book and I was part of the story myself. I soon became addicted to this story and as I had no idea of how the story was going to pan out I felt compelled (in a nice way) to keep reading on and on and on, but reading this book certainly didn’t feel like a chore. This book kept me gripped and on the edge of my seat throughout. I was concentrating so hard that every single little noise I heard made me jump out of my skin. I am a bit of scaredy cat in that sense. For me ‘Turn The Other Way’ is very well written. The author has an engaging writing style, which entices the reader in and ensures that you keep reading. He has devised a clever plot with complex characters and this book certainly kept me guessing as to certain aspects of the story. In short, I thoroughly enjoyed reading ‘Turn The Other Way’. Even though I don’t usually read books from the horror genre, I am so pleased that I read ‘Turn The Other Way’. I can’t believe that I have left it until now to discover Stuart’s books. I will definitely be reading his other books. I would definitely recommend this book to other readers. The score on the Ginger Book Geek board is a very well deserved 5* out of 5*.